Daily Illuminator: Download Ogre-Related Rules, Scenarios, And More On e23! 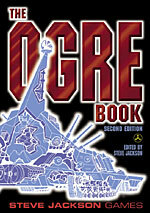 April 25, 2012: Download Ogre-Related Rules, Scenarios, And More On e23! Ogre Miniatures Lite provided the inspiration for this post. The all-knowing AI at e23 noticed an upsurge in April of downloads of that supplement. We've tied this popularity to folks hearing about the Kickstarter for Ogre Sixth Edition. So for fans of the upcoming Ogre Sixth Edition who have now been introduced to e23, welcome! When you think Ogre, you think gargantuan juggernauts dominating everything in their paths . . . and that includes the digital realms of e23, our electronic-publishing site. The classic Ogre releases on e23 are great resources for new fans fortifying their future-fighter fundamentals or longtime leaders looking to level up their libraries with portable, easy-to-search PDFs. For those who have faced the war-torn world and have yet to hear about these downloadable delights, we're here to provide proper intel. All fans of Ogre can appreciate The Ogre Book. It delivers fiction, variant rules, new units, and more. It's huge, fascinating, and tough to beat . . . just like Ogres themselves! Do you love the core boardgame and are looking for more tank-fighting tales? Then maneuver your hovercraft over to the Ogre Scenario Book 1, which has seven new scenarios that need nothing more than the maps that came with the original Ogre game. 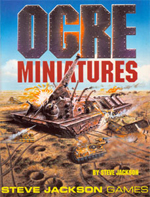 Fans of minis who like to test their metal can aid their gameplay with the PDF version of the Ogre Miniatures rulebook. Longtime enthusiasts who just need to augment their dogeared early editions can get the Ogre Miniatures Update, a free download that upgrades their original rulebook. Finally, would-be devotees can get a taste of what Ogre is all about with Ogre Miniatures Lite, a two-page version of the rules that's a quick reference sheet for experienced players and a great tool for newbies. And since we're focusing on the boardgame and minis, we won't mention GURPS Classic: Ogre, the super-cool sourcebook for roleplaying in the Ogre setting . . . that would only distract everyone from the tactical tank-fighting treats we're talking about here.